1.) Increase the amount of Legendary Siremaids in Mirage Island Dungeon 1 - Ocean's End, Robin's Memory by 100%-150%. The area is quite large and doesn't have a lot of monsters in it. This is to aid in the hunting of Undine's Garden Card, a skill card that they drop (which is already a pretty rare drop). The drop rate doesn't need to change. Hopefully, you take my suggestions into consideration~ thank you! What about the cards themselves? Would be nice to exchange some AP 1's for AP 2's and some 2's to 3's and so on up to the highest number of that type (which is 8 I believe). Thinking 5 at least? 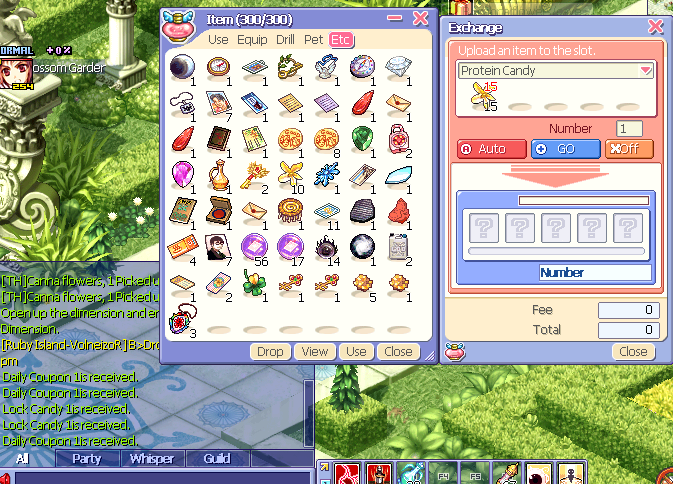 Protein Candy exchange is still bugged...it gives you daily coupons instead of Protein candies...too bad I noticed that way too late lol. Please fix it. 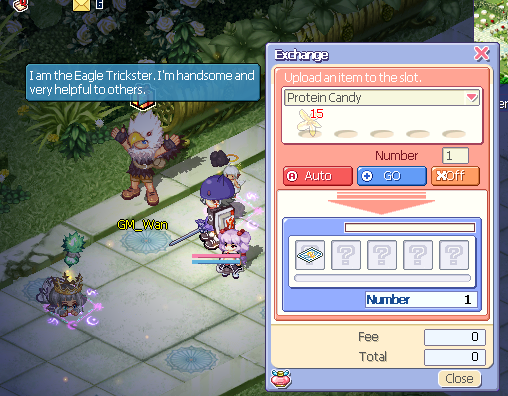 Guys who report the exchange doesn't work, can you please re-patch your game and see if it works? That would be a great idea, but I'm too lazy to make an excel since it'll be a really long list hehe. Plus it'll be a lot of stuff for the coder to do in one NPC (there is a limit as to how many exchange lists a single NPC can have). 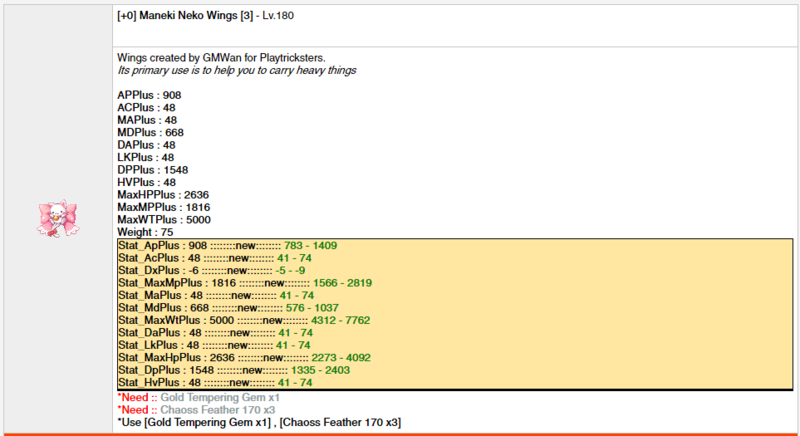 Chaos Feather doesn't match the item level of the wings (online tempering). It should be CF 245. In-game though, it requires the correct chaos feather. You were my witness this time. Chaos Feather for that wings is fixed on website. Yes, that protein candy is not fixed yet. please deal with tourmalines quickly or allow us store it at bank.Its very heavy when you keep at inventory and join hunting event DX.I cant bring any more MP pot for this long term event. Well I have a lot of fortune cards sorta stock piled on my fox (not so much MA as I would sell those away) so... we would have a great start. the Dp on the Maneki Neko wings .. Suggestion: May I request Hunter Yuna for gacha next patch (or whenever the current rotation will change)?